Hyperbaric oxygen therapy or HBOT, is a medical treatment involving the use of oxygen under pressure. Once used only to treat divers suffering from the bends, HBOT’s addition to mainstream medicine has become one of the fastest-growing treatment methods in the United States. Thousands of hyperbaric oxygen therapy facilities have been established, and the demand continues to grow. Long accepted globally, U.S. doctors are applying the healing benefits of HBOT to a broad spectrum of medical conditions. Wounds, concussion, stroke, fibromyalgia, shingles and autoimmune diseases reflect just a few of the conditions where HBOT has made a significant impact. Patients too, wanting to take an active role in their own health and well-being, are turning to HBOT as a safe, effective and drug-free way to treat a variety of problems. Consistent international and domestic use of hyperbaric oxygen therapy, supported by an ever-growing wealth of medical research, enables patients to make educated decisions when seeking treatment. Taking a pro-active approach to managing one’s health has empowered and elevated today’s modern healthcare consumer. 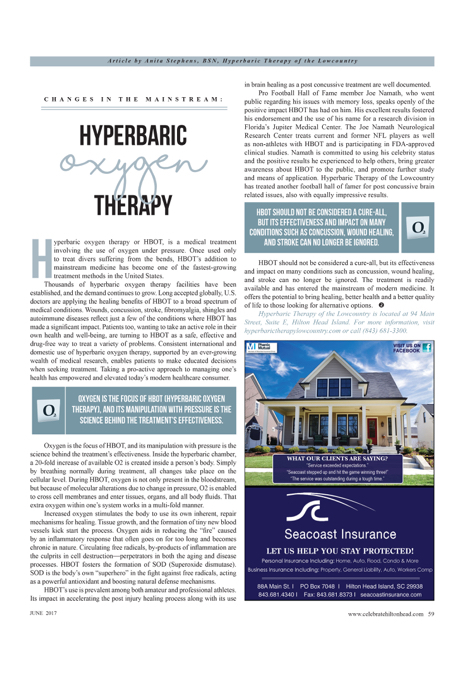 Oxygen is the focus of HBOT, and its manipulation with pressure is the science behind the treatment’s effectiveness. Inside the hyperbaric chamber, a 20-fold increase of available O2 is created inside a person’s body. Simply by breathing normally during treatment, all changes take place on the cellular level. During HBOT, oxygen is not only present in the bloodstream, but because of molecular alterations due to change in pressure, O2 is enabled to cross cell membranes and enter tissues, organs, and all body fluids. That extra oxygen within one’s system works in a multi-fold manner. Increased oxygen stimulates the body to use its own inherent, repair mechanisms for healing. Tissue growth, and the formation of tiny new blood vessels kick start the process. Oxygen aids in reducing the “fire” caused by an inflammatory response that often goes on for too long and becomes chronic in nature. Circulating free radicals, by-products of inflammation are the culprits in cell destruction—perpetrators in both the aging and disease processes. HBOT fosters the formation of SOD (Superoxide dismutase). SOD is the body’s own “superhero” in the fight against free radicals, acting as a powerful antioxidant and boosting natural defense mechanisms. HBOT’s use is prevalent among both amateur and professional athletes. Its impact in accelerating the post injury healing process along with its use in brain healing as a post concussive treatment are well documented. Pro Football Hall of Fame member Joe Namath, who went public regarding his issues with memory loss, speaks openly of the positive impact HBOT has had on him. His excellent results fostered his endorsement and the use of his name for a research division in Florida’s Jupiter Medical Center. The Joe Namath Neurological Research Center treats current and former NFL players as well as non-athletes with HBOT and is participating in FDA-approved clinical studies. Namath is committed to using his celebrity status and the positive results he experienced to help others, bring greater awareness about HBOT to the public, and promote further study and means of application. Hyperbaric Therapy of the Lowcountry has treated another football hall of famer for post concussive brain related issues, also with equally impressive results. Hyperbaric Therapy of the Lowcountry is located at 94 Main Street, Suite E, Hilton Head Island. For more information, visit hyperbarictherapylowcountry.com or call (843) 681-3300.